Yesterday at our weekly peaceCENTER staff meeting we were talking about how San Antonio already IS a compassionate city — we just need to claim it. The Jimenez Dinner, for those who live under a rock (or somewhere other than San Antonio) was started in 1979 by restaurateur Raul Jimenez, who was concerned about senior citizens who had nowhere to celebrate the holiday. He fed 100. This year they expect to serve 25,000 at the Convention Center, with the assistance of 4,000 volunteers. One volunteer interviewed in the Express-News yesterday was a turkey shredder — it makes it easier for the seniors to eat, she said. That’s compassionate. That’s also 9,400 pounds of turkey. Yikes! So back to the question — how many other cities do that? The answer: probably most of them. Most cities have a dozen or more organizations, many of them churches and community centers, that serve free Thanksgiving dinners. Jersey City and Bayonne, for example, list 17. But not many have one BIG dinner open to everyone. EVERYONE. I found a few that have a city-wide dinner. In the Quad Cities that straddle the Mississippi between Illinois and Iowa, 3,000 people are expected in Moline for their 40th annual dinner. They’ve got 400 volunteers, and the evening ends with everyone doing the hokey-pokey. It sounds like fun. Feeding NYC delivers 25,000 meals throughout New York. That’s different than having everyone gather in one place — with music and entertainment — but delivering 25,000 meals in Manhattan — I tip my little Pilgrim hat to them. Orlando, Florida has papered the Internet with the headline “Nation’s Biggest Charity Thanksgiving Dinner Gets Bigger.” Let me burst their bubble: they serve 15,000. San Antonio serves 25,000. Maybe second biggest. But it’s not a contest. 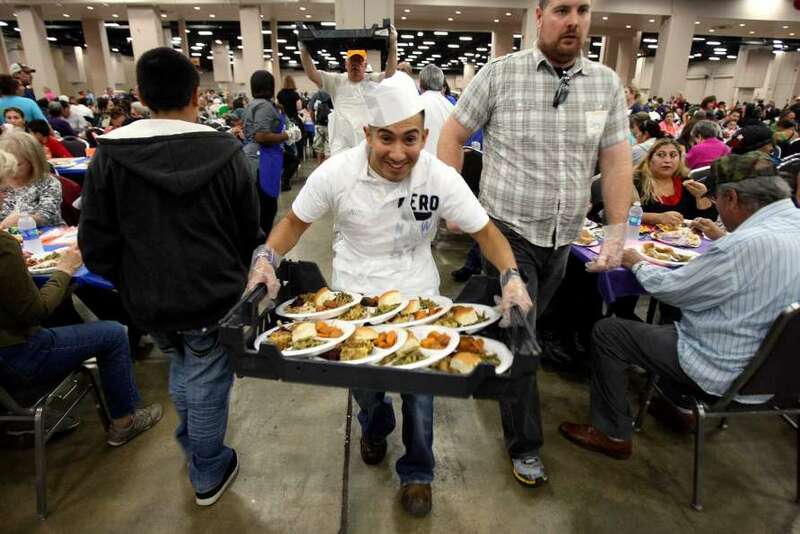 Everyone should be fed, whether in a convention center with 25,000 others or in a church basement, whether in San Antonio to the tune of mariachi or in Moline with its Hokey-Pokey. That’s what it’s all about.